Number one Scott Nicholls wants to peak at the perfect time to help Panthers’ glory bid. 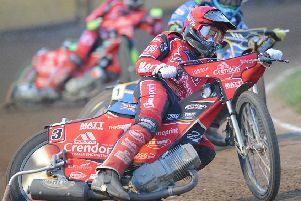 The seven-time British champion has endured a frustrating campaign - both with the city club in the SGB Championship and in the top flight where he lost his job as Rye House collapsed before struggling for form at new club Leicester. But Nicholls enjoyed a stunning couple of days when slamming in a 17+1 point paid maximum as Panthers were beaten at Berwick last Saturday and a 14+1 haul in a narrow loss at Newcastle. “I definitely needed a weekend like this,” said Nicholls. “It was frustrating from a team point of view that we only managed one point during the weekend, but really positive for me to be scoring so well. “It was only the third time I’ve ever been to Berwick so I definitely didn’t expect it to go so well, but it was one of those nights where one win just rolled into another. “I used an engine that the club have bought and it worked really well, but I was back on my own equipment at Newcastle so it was pleasing to go well on that too. “It’s been a tough year - really up and down - and I feel like I should have done more. “My away form has been reasonable, but I’ve fallen short of what I hoped to be scoring at Peterborough. “It’s a strange one really as I love riding the track, but I’ve never quite got it right there. “I’ve had a few engine niggles during the season and the Rye House situation was a huge distraction for a while. “If you’re five per cent off as a rider and the bike is not quite right either, that can be the difference between double-figures and four or five points. While Nicholls has fallen short of his own performance expectations, his vast experience has been valuable to the Panthers team. They will again tap into his knowledge bank tonight (Thursday) when travelling to Ipswich for an East Anglian derby. It’s a track where Nicholls spent a large chunk of a near 25-year career and one where he believes Panthers can again be successful. They triumphed in their last visit to Suffolk for an early-season SGB Championship Shield clash. Nicholls added: “We’re in a tough run of away fixtures and Ipswich certainly isn’t an easy place to go. They are always strong round there, but we beat them earlier in the season and there is no reason why we can’t do the same again. “We’ve picked up points really well on the road. The fact that Berwick was the first time we’ve left an away league meeting with nothing shows how well we’ve done.